Stroke can be extremely disabling, it can take away from you your motor skills, your mental skills and can make you totally dependent on others. But, to get back to your normal life, you don't just need therapies and medicines but a strong willpower and a desire to bounce back into normal life. The author assiduously worked towards relearning alphabets, words, sentences and as a result of his endeavours, he not only achieved what he set out to achieve but, earned something more. The tagline from alphabets to author is a reflection of his arduous journey. The author has tried to inspire through his example that given an adverse situation even ordinary people can achieve extraordinary feats, that is with enough self-motivation and willpower. If inspirational books interest you, you can pick this book. What I liked about the book is the author's simple writing style. There were a few typos that could be done away with but overall, it is a book that is easy to read and understand. The author has kept the book free from medical jargon and has tried to explain his medical condition in the simplest terms possible where necessary. 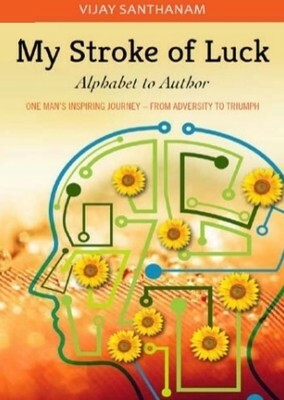 He has also suggested books and journals for anyone interested in learning more about stroke, its symptoms, terminologies and remedial therapies. But, if you look from an ordinary middle-class man's perspective, you will realize that not everyone is fortunate enough to be blessed with the money and supportive friends and family, the author had the privilege of. It played a vital role in the process of recovery for the author. So, as the saying goes 'prevention is better than cure', you must be well aware of the symptoms of stroke. So, in case you find yourself or anyone in your family and friends experiencing the same, you can take the decision that is in the best interest of your or other's health. It will also save you from the hassle and enormous medical expenses that can occur as a result of a stroke. Vijay Santhanam was born in Chennai and is an IIM-A graduate. He has worked in senior managerial positions in P&G and BP. He also has two other books to his name and both are on his passion - Cricket. He is based in Singapore now and is a visiting professor at IIM-A and IIM-Lucknow. This review is a part of the biggest Book Reviews Program. for Indian Bloggers. Participate now to get free books! Thank you BlogAdda for giving me the opportunity.